File photo of Aaron Calixte of the University of Maine as he drives between University at Albany defenders Richard Peters (left) and Joe Cremo (3). Jonathan Komagum, a forward from London who last month announced his verbal commitment to join the University of Maine men’s basketball program, has decided to reopen the recruiting process, his prep coach said Monday. The high school senior at TaylorMade Academy in Pensacola, Florida, made his decision after visiting the Orono campus April 5-7. “We were kind of told there was going to be a good nucleus of players coming back once we first got in touch with (UMaine coach Richard) Barron, but once Jonathan got up there he saw that it doesn’t seem to be the case,” said TaylorMade head coach Anthony Taylor. “He found out there were about six kids who were actually going to be leaving. I think that prompted Jonathan to look at it a little different and I think that prompted coach Barron and his staff to think a little different as well,” Taylor said. Barron is prohibited by NCAA rules from commenting on a recruit until the university has received a signed National Letter of Intent. Komagum’s decision also was related to what Taylor believes is Barron’s recruiting emphasis on finding proven college players as the Black Bears’ new head coach seeks to rebuild a team that has averaged only six victories over the last four seasons. “They’re in a situation where it’s really tough to win now when you bring in six freshmen so they’re looking to go get maybe four transfers whether they’re juco or grad and then a couple of freshmen,” Taylor said. Portland High School guard Terion Moss, who was chosen Mr. Maine Basketball and the Maine Gatorade Player of the Year this season, has already accepted a scholarship offer from UMaine. Komagum averaged 11.5 points and 9.2 rebounds last winter while shooting 52 percent from the field and 68 percent from the free-throw line. He also led his team with 75 blocked shots in 28 games. Komagum had selected UMaine over Alabama State, Alabama A&M and South Carolina State. Since reopening his recruiting he has received inquiries from Eastern Washington, Kennesaw State and Wagner, Taylor said. More than 700 Division I players transferred after the 2016-2017 season and as of Monday 429 players from the 2017-2018 season already have followed suit, according to verbalcommits.com. The website’s list includes six who were on the most recent UMaine roster — graduate transfer Aaron Calixte, Dennis Ashley, Trae Bryant, Danny Evans, Vernon Lowndes Jr. and Duncan Douglas, a 6-foot-6 forward who left the team last December due to injury. “I’ve run into situations where two or three guys leave a program and sometimes that opens a door for someone we have at a position,” Taylor said. “Typically it doesn’t work against us where the situation is that the team has to get older. 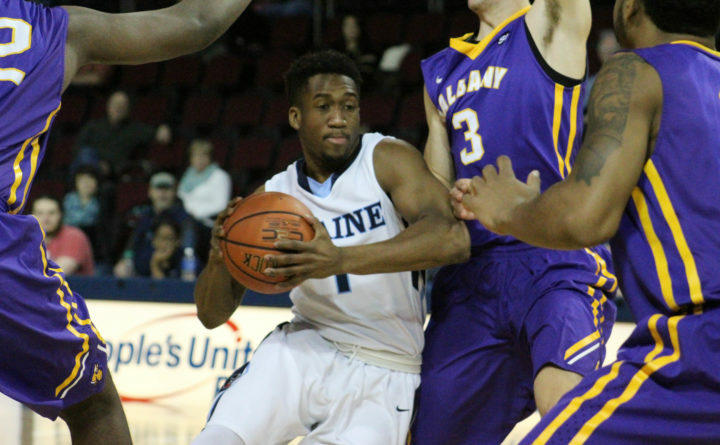 UMaine redshirt junior guard Calixte, who earned All-America East third-team honors last season, is scheduled to visit the University of Oklahoma this weekend as originally reported by CBS Sports’ Jon Rothstein. Calixte, who will graduate in May, is seeking to use his final year of eligibility at a high-major Division I program under an NCAA rule that allows graduates to transfer and play at the new school immediately. Oklahoma seeks a guard after All-American Trae Young opted for the NBA draft and Jordan Shepard chose to transfer. Calixte also reportedly is considering DePaul, Florida State, Missouri and Grand Canyon University in Phoenix. Florida State on Monday landed another America East graduate transfer, University at Albany guard David Nichols. Follow BDN Maine Sports on Facebook for the latest in Maine high school and college sports.